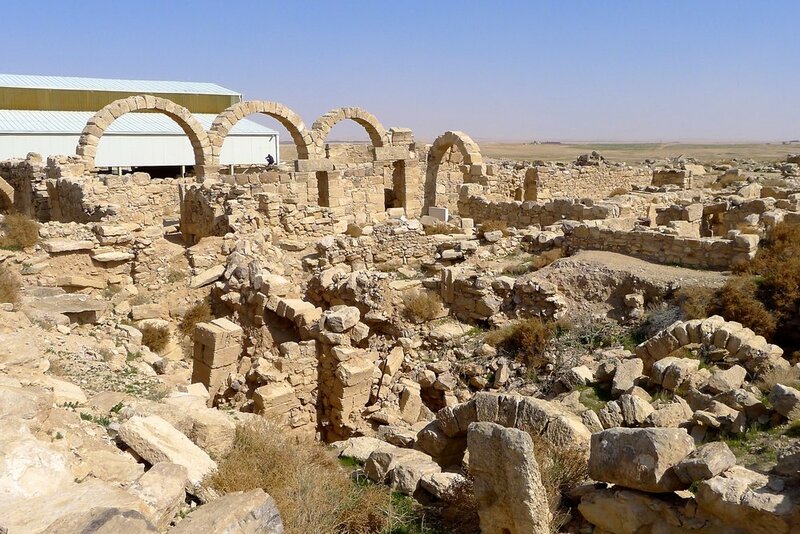 Approximately 50 miles south of Amman, a few miles off the Kings Highway, lie the ruins of a 5th century village that are so well-preserved you can almost envision the locals living there over 1,500 years ago. The village of Umm ar-Rasas (31°30′2″N 35°55′15″E), was declared a protected cultural UNESCO World Heritage Site in 2004 and is free to the public, though few people seem to take advantage of it, making it all the more private for those of us who do. To get there from Amman, take the Kings Highway south past Madaba. You will then see signs for Umm ar-Rasas. Following the brown signs, you’ll turn off and bump along the two-lane road that seems to head to nowhere, but keep an eye on the right horizon. Soon you will see what appears to be a huge pile of rocks, and you won’t be wrong. But as you come closer, you’ll realize that this is the stone wall that surrounds the extensive grounds of Umm ar-Rasas. Follow the road around to the right and park at the modern visitors center from where you’ll begin. Note, there are modern clean bathrooms here, but it might be advised to bring some tissues (frankly good advice for pretty much anywhere). The majority of the site has yet to be excavated, however, the uncovered remains, which can be explored quite thoroughly, span several hundred years, covering Byzantine and Umayyad periods. And as you wander, you’ll find countless good spots for a picnic, so pack it along, but remember to take all trash with you. This is not the place to leave your mark on history. In addition to the amazing structures still standing, with doorways and windows and archways with carvings on them, they have uncovered the most complete, and largest, mosaic floor in all of Jordan. The remains of St. Stevens Church, dating from 785 A.D., now stand protected under a large open-air roof with an extensive set of catwalks allowing visitors to see, but not disturb, the mosaic floors. Their condition is really astounding and cannot be overstated. After thoroughly exploring all that you can, and letting the kids wear themselves out completely (keeping an eye out for the skittering lizards everywhere), take the time to make one little side trip to see the strange square Stylite tower less than a kilometer away before you head off. Just past the visitors center, at the next intersection there is a faded sign saying, “To the tower”. Take this right-hand turn and follow the windy road. It will lead to a fence and gate surrounding a stone tower standing 15 meters tall with building remains around it. It is said that there are no internal stairs in the tower, just a room at the top with windows on all four sides. It is believed that this might be the tower of fifth-century Christian ascetic, Simon Stylite, who is said to have spent 38 years atop a pillar near Aleppo in order to concentrate on his prayers. Regardless of its unknown origin, it is an amazing site and worthy of a quick stop. Heading home, you can return to the Kings Highway, or you can use your GPS to take you through the back roads into Madaba, along which you'll see various structures (like an unassuming bus stop) seemingly inspired by Rasas-like architecture. So, depending on your energy levels, and nap-needs, Umm ar-Rasas could be just the beginning of your day’s explorations.